The money will be used to tackle underlying causes of sectarianism and violence. 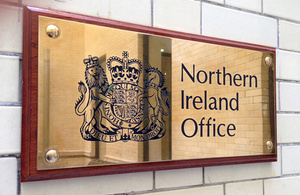 Secretary of State for Northern Ireland, Rt Hon James Brokenshire MP, has today announced an additional £250,000 of UK Government funding to tackle the underlying causes of sectarianism and violence and to build a stronger society. The financial package is a further contribution by the UK Government to support the work of the International Fund for Ireland. The new money builds on the financial package put in place under the Fresh Start agreement which allocated £500 million to assist the Executive in tackling issues unique to Northern Ireland, including support for their programme to remove peace walls. By working towards the removal of peace walls, preparing young people from all walks of life to become economically and socially engaged and promoting shared education, the International Fund for Ireland makes a vital contribution to overcoming division within Northern Ireland society. They are helping to create a genuinely shared future for people in Northern Ireland. This extra money from the UK Government will support this important work. Under the Fresh Start Agreement in November 2015, the UK Government undertook to provide £60 million over 5 years in support of the Executive’s delivery of confidence and relationship building measures between communities which would provide the conditions to allow for the removal of peace wall and the creation of a shared future. We are grateful for the generous support and encouragement from the UK Government. Along with the Irish Government, they have enabled the Fund to support many communities that have become marginalised and divided as a result of the conflict. The value of the Fund’s international support and the independence it fosters has never been greater nor has our willingness to take measured risks for a lasting peace. The achievements of our approach are significant and set us apart from other funders.